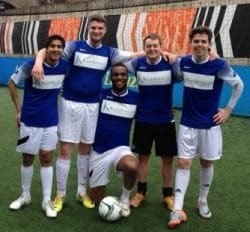 Kain Knight, a leading firm of Costs Lawyers, held their own warm-up to the forthcoming World Cup 2014 by inviting several leading law firms and barrister’s chambers to participate in a friendly, though not always, knock-out football tournament in “trendy” Shoreditch, London. On an exceptionally cold evening last Friday, eight teams took to the astro turf for the glory of winning the Kain Knight trophy and, after a very hard fought final between Slater & Gordon and Collyer Bristow, Slater & Gordon were victorious at 4-3. Matthew Kain, Director of Kain Knight, said “following the success of this event, it is intended to make this an annual event and we look forward to welcoming teams again in 2015”.